Application: Finishing Sauce, Dressings, Dips, Compound Sauces, Grilled Meats, Veggies, Soups & Pasta! When someone mentions fish sauce, Italy doesn't usually come to mind, but fish sauce was actually one of the earliest documented condiments used in Ancient Roman cuisine. Back then it was referred to as Garum. Today, Sicilian based fish preserving company Scalia Benedetto is bringing this wildly versatile sauce back into the lime-light. 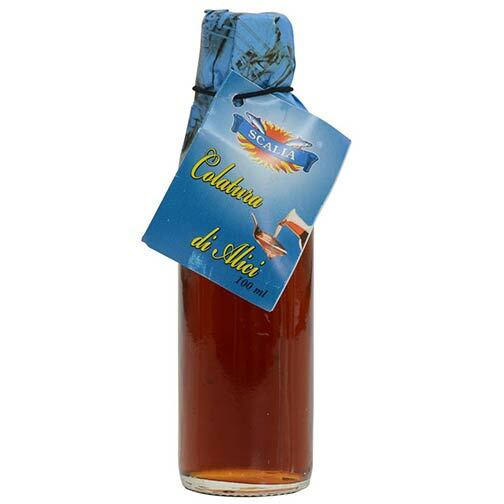 Colatura di Alici (Co-la-tur-ah Dee-ah-leechee) is the contemporary version of Garum, but is made the old-fashioned way resulting in a richly refined sauce. Blue Sicilian anchovies are seasonally caught along the beautiful Amalfi Coast, hand picked directly from the boat, and trimmed & salted immediately before being neatly layered between blankets of Sicilian salt and snuggly fit into wooden barrels that get closed with a wooden disk. A weight is placed on top of the disk to press the anchovies and for the next 4-6 months concentrated drops of priced amber liquid are released through a filter into the bottom of the barrel where it’s collected and instantly bottled.